When Marvel and Disney joined forces in 2009, it was clear the landscape of film making would be forever changed. Films from Marvel Studios over the last few years have been making box office history, none more surprising than Guardians of the Galaxy. When the first film was released in 2014, it showed audiences a new style of sci-fi comedy story-telling that they had yet to see in previous superhero movies. With a wonderfully unique combination of comedy, drama, adventure, and a retro feel all rolled into one, it’s no wonder that moviegoers across the globe have been hotly anticipating the release of Guardians of the Galaxy Vol. 2, coming out May 5, 2017. 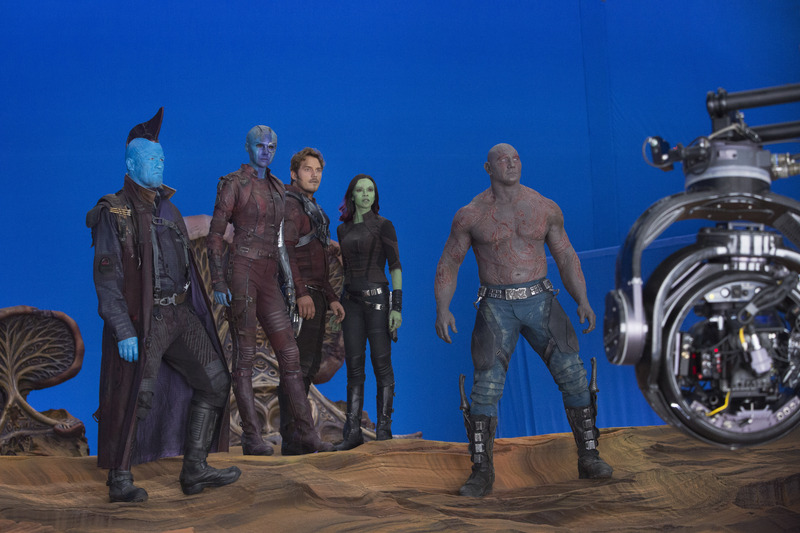 I was recently given a once in a lifetime opportunity to interview the cast and crew behind both Guardians of the Galaxy films and learn more about the process of creating and filming these awesome movies that Marvel fans can’t get enough of! Chris Pratt who plays lead character Peter Quill (or how he likes to refer to himself as, Starlord), was able to work with a few new actors in the second film. One major addition to the cast was Kurt Russell, who plays Ego. Pratt expressed how Russell is an acting icon for him, and that he couldn’t help but “geek out” upon first meeting him. During the film making process, Pratt started out as Russell’s fan, and now is honored to be his friend and his peer, since they connected almost instantly. Kurt Russell has long had a relationship with Disney, and now doing another Disney project by acting in a Marvel film is adding on to his legacy with the company. Although he has a special relationship with Disney, Russell said he goes into every project he does with the mentality that you have to work hard to earn the cast and crew’s respect by giving each role your all. One part of the film making process that really stands out to actresses Karen Gillan (Nebula), Zoe Saldana (Gamora), and Pom Klementieff (Mantis), was getting into makeup! All three completely transform to look like their characters, recalling that the makeup process is the most difficult part for them of making these films. For all three, it takes an average of four hours to get into their characters’ hair and makeup. Another unique way characters are brought to life on screen in Guardians of the Galaxy Volume 2 is through the creation of Rocket. While Bradley Cooper voices this fiestey raccoon, Sean Gunn (who also plays Kraglin) plays Rocket on set. The film makers use motion capture to film his movements to help create the quirks and nuances of Rocket when animating him. Zoe Saldana said her favorite part about Volume 2 was getting to develop the relationship between Gamora and Nebula. Dave Bautista was most excited to get the chance to work with the Guardians cast again. Now that he knows everyone, he felt more comfortable diving dipper into his character. When beginning the process of creating Guardians of the Galaxy Volume 2, director James Gunn wanted to make sure the sequel wasn’t following the same template as the fist. Gunn loved that audiences were surprised by the first film since it was so unique, and he wants to do the same with Volume 2. Guardians of the Galaxy Vol. 2 is out in theaters May 5th, you can find tickets here!